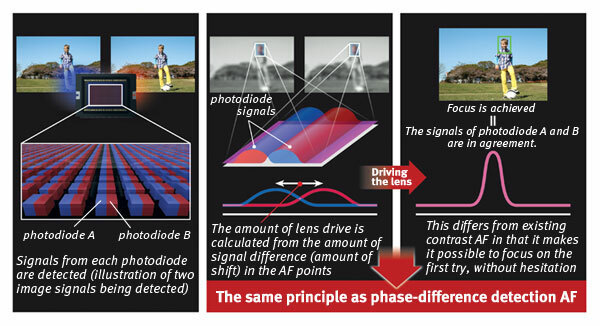 Canon Dual-Pixel CMOS AF system is a complete breakthrough in the field of Auto-focusing technology. The Canon 70D announced on Jul 2, 2013 was the first camera that features Dual-Pixel CMOS AF technology. The Dual-pixel CMOS AF Sensor features two photodiodes distributed to each microlens. As a result, two parallax images are captured at once. With Dual Pixel CMOS AF, the amount of lens drive is calculated from the amount of signal difference (amount of shift) in the AF points. When the signals of two photodiode are in agreement the Focus is achieved. The Dual Pixel CMOS AF takes very shorter focusing times and gives you exceptional tracking performance and smoother autofocusing during video shooting. Live View shooting can be used in a manner similar to using the camera’s viewfinder, the fast and smooth AF performance allows users to concentrate more attention on the subject and composing the photo when shooting. Dual Pixel CMOS AF also supports 103 models of EF lenses (including many earlier models), enhancing a photographer’s creative options as well as maximizing the benefit of Dual Pixel CMOS AF in a variety of situations. How Panasonic DFD Technology Work? While looking at the recently published spec comparison at our website many of our users are sending few common questions to us, it includes; How Panasonic is able to do AF in just 0.07 sec with the help of contrast based technology? Does DFD technology is actually a firmware or hardware thing ? Where does the Panasonic DFD Actually placed, inside the sensor or somewhere else ? Panasonic DFD is hardware and exclusively designed & developed by Panasonic and it’s not a software. DFD autofocus relies on special hardware in the camera’s processor, so can’t be brought to older models via firmware updates. Before we explain that we have to understand how the traditional contrast based system work, the traditional contrast detect system based camera actually. Camera having a normal contrast based Sensor determines the best focus point by moving the AF ring and scanning the entire subject, once the scan is done the lens AF reverse back to peak focus point. However when a Panasonic camera uses DFD technology, it quickly predict aka calculate the AF point and move AF point quickly there, finally it uses contrast based system to fine-tune the AF point. So don’t get confused that Panasonic newly announced camera is using contrast based system only, the Camera AF based on DFD tech and later it fine-tuned by contrast AF. The biggest advantage of this technology that sensor doesn’t have any single dead pixel like other Hybrid AF sensors have for phase AF. CCD sensors create high-quality image with low-noise. CMOS sensors, traditionally, are more susceptible to noise. 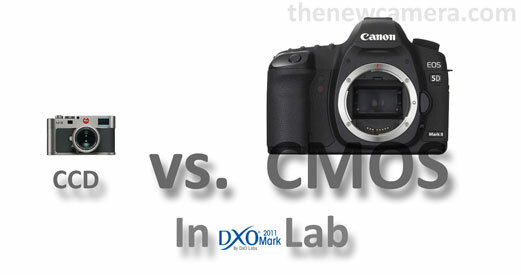 CCD have better light sensitivity compared to CMOS, CMOS traditionally consumes less power. CMOS sensors cost less to produce. A CCD image sensor is an analog device. In a CCD sensor, When light strikes the chip every pixel’s charge is transferred through a very limited number of output nodes (often just one) to be converted to voltage, buffered, and sent off-chip as an analog signal. All of the pixel can be devoted to light capture, and the output’s uniformity is high, as a result the overall image quality is high. In a CMOS sensor, each pixel has its own charge-to-voltage conversion, and the sensor often also includes amplifiers, noise-correction, and digitization circuits, so that the chip outputs digital bits. These other functions increase the design complexity and reduce the area available for light capture. With each pixel doing its own conversion, uniformity is lower. But the chip can be built to require less off-chip circuitry for basic operation. Lecia M9 is a well Known (only)fullfarme camera uses 18 Mpix CCD sensor, It is important to note that Leica is the only brand that still makes cameras with CCD sensors; all other main full-frame cameras have CMOS sensors., DxOMark lab tested the M9 ccd sensor and compared with other CMOS sensor Camera and the result was quite amazing. The Leica M9 provides good image quality for low ISO, but its results for high ISO are weak, with dynamic range decreasing very fast. 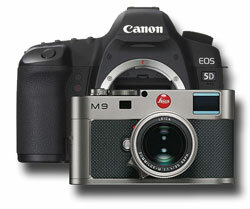 The Leica M9 achieves the lowest score among measured full-frame sensors. Conclusion: CMOS is a clear winner – There was a time when CCD was the better choice for image quality but the recent development in technology resulted a new and better CMOS sensors with better light sensitivity, image quality, less noise, low power consumption and less cost compared to a traditional CCD sensor.